Toledo, OH - On Sunday he set a new single season points record for the Walleye and today forward Tyler Barnes has been named CCM ECHL Rookie of the Year. He is the recipient of the John A. Daley Memorial Trophy as the player selected most proficient in his first year of competition. Barnes just set a new Walleye single season record with 74 points as he finished with 34 goals and 40 assists. He collected his second hat trick of the season in Sunday's 8-2 win over the Kalamazoo Wings. The 25-year-old finished the year leading all rookies in points and goals (34). "A great and fitting honor for Tyler," said Head Coach Derek Lalonde. "His success came from his team first mentality. As the year went on he established an everyday mentality that led to great consistency on the ice." He ranked second to teammate Shane Berschbach (48) in assists with 40. The native of Burnsville, Minnesota had 12 power play goals-- which are also the most for a rookie-- and he finished with 19 power play points. He also led all first year players with six shootout goals this year (in eight attempts). Barnes was named ECHL Rookie of the Month for December when he had seven goals and 10 assists. Prior to turning professional, he spent four seasons at the University of Wisconsin. He scored 45 goals with 58 assists in 152 games for the Badgers. John A. Daley passed away in 1996 and was one of the founding fathers of the ECHL. He served as General Manager and minority owner of the Johnstown Chiefs from its inception in 1988 until 1994. 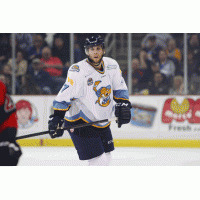 Barnes joins Sean Venedam (1997-98) as the only players in Toledo ECHL history to win the award. The Walleye playoff run begins on Thursday, April 16 with a best-of-seven Division Semi-Final Series against the Wheeling Nailers. Our Fish. Our Fight.